Dr. Sasan Massachi always appreciates feedback from his valued patients. To date, we’re thrilled to have collected 123 reviews with an average rating of 4.98 out of 5 stars. 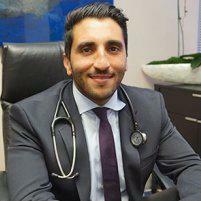 Please read what others are saying about Dr. Sasan Massachi below, and as always, we would love to collect your feedback. Once again I am so ever grateful to Dr. Massachi's abilities. My 22 year old Yeshivish son had put on a lot of weight during his time learning. He saw Dr Massachi for a physical and blood work. Dr. Massachi reviewed the results of the tests with my son in detail and outlined a plan. My son saw the facts and began the plan. He has changed his diet, is sleeping better and lost 40 pounds. Thank you so much for your ability to reach young people and encourage them to take responsibility of their health. Dr. Massachi is the nicest guy and is incredibly knowledgeable. His new office is beautiful and clean. His office staff are incredibly friendly, and the wait time is low. I've recommended him to all of my friends. Easy to schedule an appointment and clearly answered all my questions. Low wait time, nurse was very friendly. Dr. Massachi was cordial and understanding as always. I was in and out and felt that I got great care. Dr. Massachi is always very personable and thorough, and has a great manner. I’ve been very happy with his care over the years. I recommended him to several friends that think very highly of him as well. Dr. Massachi is a whole health doctor. He cares about your wellbeing, is professional, kind, and thorough. Great first experience. I will come again and recommend to friends. Dr. Massachi is a 5 Star Physician. He is very intelligent and very kind. Dr. Massachi is very caring, as he always listens to my concerns and answers all my questions. I could not imagine having another Doctor. It was so easy and thorough! Thanks! Really nice and sweet. Takes a minute for him to warm up. I've moved around and had several doctors. Dr. Massachi is by far the best, period. Friendly staff. Did not make me wait long.